It must have been something. At their peak of popularity, New York had at least 50 Automats, filled with little slots containing sandwiches, mac and cheese, pie, and other foods, each to be had for just a coin or two. The one below was at Broadway between 46th and 47th Streets. William Grimes sums up the appeal of the Automat in his entertaining 2009 book Appetite City: A Culinary History of New York. Here’s a similar postcard, and a memory from Patti Smith, about getting hit on by Allen Ginsberg at a downtown Automat in the 1970s. This entry was posted on March 7, 2013 at 5:59 am and is filed under Bars and restaurants, Midtown, Poets and writers. You can follow any responses to this entry through the RSS 2.0 feed. You can leave a response, or trackback from your own site. We ate there when we returned to this country and spent several days in a Times Square hotel. It’s where I developed the distaste for chicken pot pie. Another fascinating book is “The Automat” by Lorraine B. Diehl and Marianne Hardart (great-granddaughter of Automat co-founder Frank Hardart.) Filled with history, reminiscences and photos, it also contains the original recipes for many Automat favorites, such as Baked Beans, Macaroni and Cheese, Chicken Potpie and Rice Pudding. A treasure! I still remember how good the hot chocolate was! 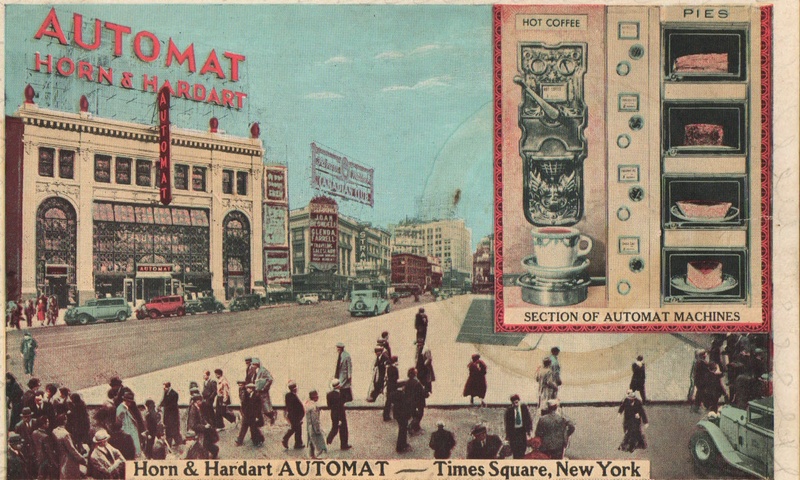 I never knew about the Automats…Very interesting. The library also had handouts of Horn & Hardart recipes that were more accurate than those in the books about NY food or the Automat. They’re available at various websites – just be sure they’re attributed to NYPL. I make the mac and cheese or the baked beans any time that I’m cold, hungry, and nostalgic. I wish I could have dined at an automat. So cool. I have fond childhood memories eating at the Horn and Hardarts with my family. The last one I ate in was the one on 34th Street and 8th Avenue sometime in the ’70s. I think somebody wrote a song about this, http://en.wikipedia.org/wiki/Concerto_for_Horn_and_Hardart . . .